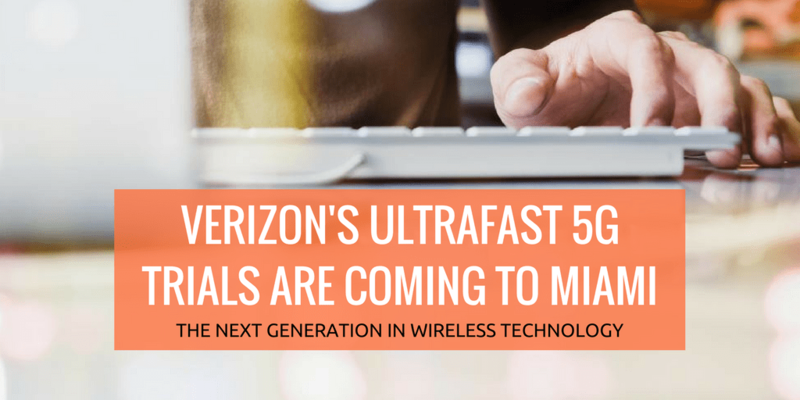 Verizon’s Ultrafast 5G Wireless Internet Trials Are Coming to Miami, FL. Whether or not you have heard of 5G, the latest development in wireless technology, keep reading to learn more about this remarkable innovation and how you can possibly get it free for your Miami business or home! Before you get too excited, unfortunately, the trials are a quite limited, only about 500 customers will be able to participate across a handful of selected cities, but luckily Miami is on that list. Long story short, you’ll be able to apply for a free one-year trial for Verizon’s 5G field test, and if you’re lucky, you’ll get in and be able to enjoy insanely fast browsing speeds. What is 5G, and how fast is it anyway? If you’re not a super-nerd, chances are you don’t know what 5G is. 5G stands for “fifth generation” wireless technology. Currently, the fastest internet services available are “Google Fiber” and “AT&T Gigapower” both of which boast up to 1 gigabit per second. Now, that is going to be blown out of the water by 5G, which is expected to be twenty times faster than Google Fiber, processing a full 20 gigabits per second, but we are not there yet. In the most recent field tests, Verizon was able to hit 10 gigabits per second, which is very impressive for an over the air connection. Unlike 4G LTE and other previous generations, 5G is not a cellular service. Instead, it will replace broadband services with more than enough computing power. It’s fast enough to download over 200 hours of video footage in less than half an hour, a task that would usually take over 60 hours or more even with a high-speed broadband connection. Why is 5G Wireless So Exciting? If you’re not convinced by the speed alone, here are a couple of other benefits to participating in the 5G field trial. For one thing, 5G is super-responsive. That means that if you needed or wanted to, you could remote drive construction vehicles from the other side of the country with virtually no delays when sending commands over the internet. It’s also so power-efficient that a farm could utilize low-power sensors running on 5G for over ten years. Because of the extremely low latency, it will certainly help push online gaming and other multimedia applications like virtual reality to the next level. How Can I get 5G Now? Unfortunately, 5G’s full potential won’t be reached for a few years, but if you’re lucky, you can be one of the businesses that get the chance to participate in the trial and help work out any kinks in the system. In order to get into the trial, you have to be in one of 11 cities that have been selected to participate. The 11 cities are: Sacramento, Denver, Atlanta, Brockton, Ann Arbor, Bernardsville, Houston, Dallas, Seattle, Washington, D.C. and… Miami! Now all you have to do is wait and see if you are within one of the specific neighborhoods that will have been chosen to test this service. You’ll know because you’ll receive a mailer by the end of March or early April. If you do get a mailer, all you have to do is send it back and Verizon will send out representatives to give you more information. Verizon will check to see if you are eligible by simply being in one of the selected test areas. If you are not currently a Verizon customer, that won’t keep you from being able to participate. They are looking for a variety of situations for testing their product. Private homes and businesses can both be selected based on the building’s proximity to their infrastructure and what building type they need more of. If you are one of the 400 – 500 lucky people who is selected for the trial run, Verizon will come and set everything up for you. Depending on your current setup, they may or may not need to run a cable through your wall to attach an antenna to the outside of your building before you get to enjoy the unbelievably fast speeds of 5G. Thank You for reading! We’ll be all over Verizon’s 5G trials so don’t forget to check back for news and updates. Also if you have any questions, please let us know in the comment section below. What we do: iFeeltech helps small business start-ups and professional practices who are looking for an IT support partner to help them grow by implementing IT systems that are robust, backed up and fully supported. Learn more about our IT solutions here. https://ifeeltech.com/wp-content/uploads/2017/03/Verizon-5G-Miami-iFeeltech.png 512 1024 Nandor Katai https://ifeeltech.com/wp-content/uploads/2013/04/iFeeltech-Logo-Enfold.png Nandor Katai2017-03-03 11:28:592018-05-01 10:03:57Verizon's Ultrafast 5G Wireless Internet Trials Are Coming to Miami, FL. What You Need to Know if You’re Still Using Microsoft Office 2013 The 7 Things You Need to Do for Your Small Business Network Security.